Stamping Rules! : Dream Pop Blog Hop! Welcome to our Dream Pop Blog Hop! 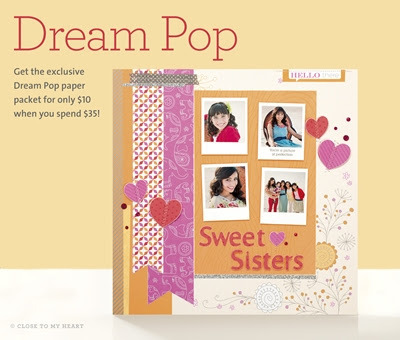 We will be featuring the National Scrapbooking Month special, an amazing specialty paper packet called Dream Pop. If you have come here from ADELINE'S BLOG, you are on the right path! This month we have loads of Close To My Heart Consultants sharing their dreamy creations using this super sweet paper on their blogs. This is simple to do - just click on the link at the end of the post on each blog to move to the next one! Here we go! This month I made a single page layout featuring my youngest son Max. I loved the April Sketch from Practical Scrappers, and serendipitously it almost matched the background layout of one of the Dream Pop Papers. That's right - the yellow grid, lovely sketchy flowers, and some of the washi type elements were already in place just waiting for some quick customization! And I totally used the word serendipitous because I'm linking this page up to the fab linky party going on over at Paper Issues! In the title shot you can see how the cardstocks from this pack are embossed with a glossy raised pattern. How fun is that? I emphasized Max's name with letters cut on the cricut from glitter paper, and embellished some of the pre-printed flowers with wooden disks topped with grey sparkles. Here you can see some more of the embossed cardstocks. The pics are all printed straight from my Instagram feed with one of my fav new things, Prinstagram! I love the combo of the rustic wooden embellies from the Wooden Mini Medley collection against the sliver glitter paper and sparkles. The little arrows I trimmed by hand from a banner I cut on the cricut. Here you can also see the fine yellow grid printed on the background - I LOVE all the details included on this awesome paper! I'm linking this to the Heart 2 Heart Button Up challenge for all my cute wooden buttons topped with grey sparkles! Now "Hop" on over to MARIA'S BLOG to see what she's dreamed up! Be sure to visit all the Consultants Blogs to soak in the great crafting and Dream Pop ideas. Remember, this amazing paper packet is only available while supplies last in the month of May. Contact your CTMH Consultant (or click here) to see how you can get this paper packet for just $10! Oh tons of cuteness on this page! Terrific job! FaBulOUs!!! Just spotted this sketch yesterday and you've inspired me to get scrappy! Thanks Wendy! Am following the Dream Pop blog hop! I'm also a consultant... love love your layout! love all the little details! and love your Hoot Hoot card! Wanted to say hi as see you live in Portland. I grew up there.... just moved here to La Pine, Oregon last summer from Washougal, WA (just across the river from you!). Am going to follow your blog as love all of your ideas! Hi, Marilyn (can you see me waving?)! I'm a transplant, but we just love living in Portland so much. I have downline holding a bunco in Washougal this afternoon. Small world! absolutely and totally awesome! thanks for playing along with H2H!